NiceDeb posts this excellent 18-minute summary of the crumbling Obama-Israel relationship since our dear leader took office. Our only criticism is the narrator softens and dilutes her statements in this, as if these Liberals Progressives Communists deserve the benefit of the doubt after 3.5 years of failures. As if she could easily switch her vote back to the Democrat Party. 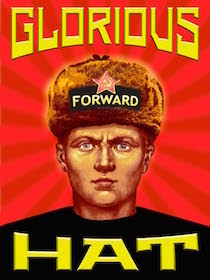 The Democrats did what we predicted when we started Ushanka in October 2006 - they failed at foreign policy. They failed to keep forces of evil at bay, and stand with our closest allies. Clinton failed with Al Qaeda. Carter failed with Iran and the USSR. Johnson failed with Vietnam. Kennedy failed with Cuba. Truman failed with the infiltration of communists in his administration.